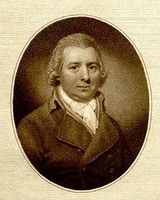 William Curtis was born in Alton, Hampshire, where he served an apprenticeship as an apothecary; he then moved to London and set up his own business. This proved sufficiently successful for him to sell out and he was then able to devote himself to the study of plants. Curtis cultivated some 6,000 species of plants in his garden in Lambeth Marsh but his prime interest was in native British flora and with the help of Lord Bute he embarked on the Flora Londinensis, a six-volume illustrated work describing the flora to be found within a 10-mile radius of London. This work, although highly praised, was not remunerative and he, therefore, in 1787, founded the Botanical Magazine or Flower Garden Displayed. The principal artists were William Kilburn, James Sowerby, Sydenham Edwards and Walter Fitch. This periodical is still being published, although it was renamed Kew Magazine in 1984.